A plant-based dish brush made from coconuts and FSC timber. Being non-scratch, it is great for non-stick pots and pans and safe on plates, dishes, glasses and stubborn tea stains on mugs. Plastic free, compostable and biodegradable. Ethically made in Sri Lanka. 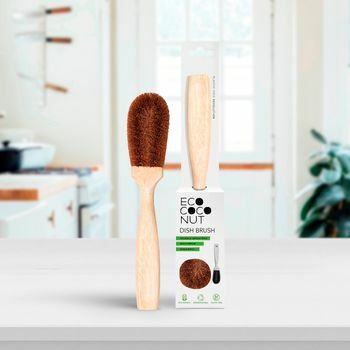 A plant-based dish brush made from coconuts and FSC timber. This durable cleaning brush is specially designed for a good handle grip and getting into hard to reach places. Being non-scratch, it is great for non-stick pots and pans and safe on plates, dishes, glasses and stubborn tea stains on mugs. Made ethically in Sri Lanka from sustainably farmed coconut fibre (or coir as it is more commonly known) wrapped around a stainless steel wire and FSC accredited timber. Coir is a natural fibre extracted from between the hard internal shell of the coconut and the outer coat of the coconut. As well as being totally natural, the bristles on this brush are also naturally antibacterial, free from toxic chemicals, compostable and biodegradable.